Description: No matter where we go in the world, the face of a beautiful child always attracts our attention. 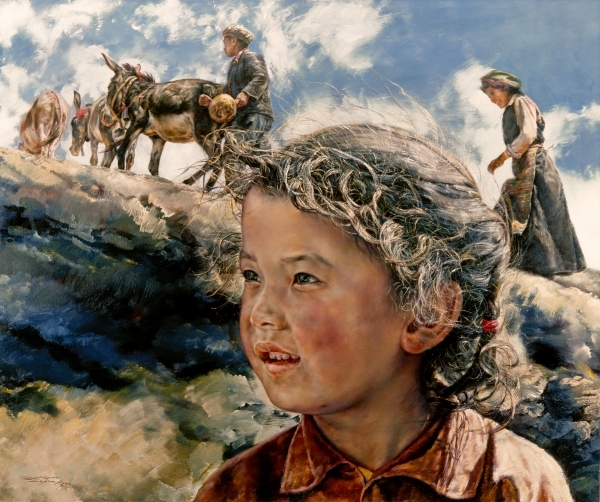 Besides depicting the ethereal beauty of the child, The artist also shows us a brief glimpse of Tibetan customs and way of life. These people commonly use donkeys and horses for transportation in somewhat nomadic lifestyle. Piling all their possessions on the animals backs or on makeshift carts is a cheap, though not necessarily easy way for them to get where their going. It may look quite simple to western eyes, and for the most part it is, but it's an honest life and the beauty of it can't be easily ignored.